Reflexology dates back to ancient civilizations such as Egypt, India and China, but this therapy was only introduced to the West in the early 20th Century. 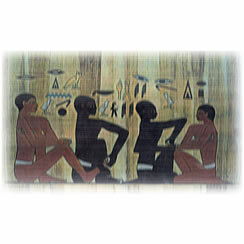 The pictograph at the right shows two men working on the feet and hands of two other men. The hieroglyphics above the scene read ‘Do not let it be painful’ says one of the patients.‘ I do as you please’ the practitioner says. In China there is evidence of some form of foot and hand therapy being practiced as long ago as 4,000 B.C., and the North American Indians have practised a form of foot therapy for hundreds of years. Had it not been for the enquiring medical minds in the late 19th and 20th centuries, the modern understanding of foot reflexology might never have happened. Dr William Fitzgerald USA 1872-1942 was an Ear Nose and Throat Surgeon. He practiced in the USA, briefly in London and Vienna for 2 years. He was the founder of “Zone Therapy”, an early form of reflexology. Through his research he discovered that if he exerted pressure on the tips of the toes or fingers, a corresponding part of the body would be anaesthetised. 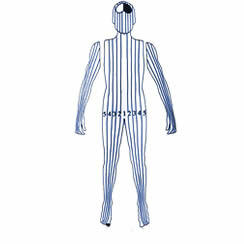 From this theory he divided the body into 10 equal zones running from the top of the head to the tips of the toes. He found that by applying pressure using tight bands of elastic on the middle section of each finger, or by using small clamps that were placed on the tips, he could carry out minor surgery using this technique only. These were very controversial ideas at the time. He wrote publications such as “To stop that toothache – squeeze your Toe” and “Zone Therapy or Relieving Pain in the Home”. She was a Physiotherapist who worked in a Doctors practice and she used Dr Fitzgerald’s Zone Therapy method. However, she felt that the therapy could be more effective on the feet than the hands. In true pioneer style, Eunice Ingham travelled around America for 30 years teaching Reflexology first to Doctors and Nurses and then to non-medical practitioners. She developed charts and theories called the INGHAM METHOD that form the basis of modern Western reflexology today. 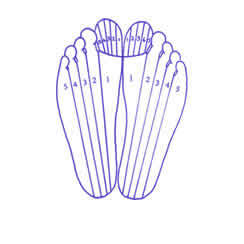 Her work is carried on by The International Institute of Reflexology. Eunice Ingham continued to work up to the age of 80. She died at 85 in 1974. I really admire the vision and spirit of Eunice Ingham. Imagine travelling as a woman in the 1930’s across America and approaching the medical profession with a new unconventional therapy like Reflexology, it must have taken great belief and determination.